Tommy Fleetwood takes positives from his recent run of form and assesses his chances of winning the Race to Dubai. 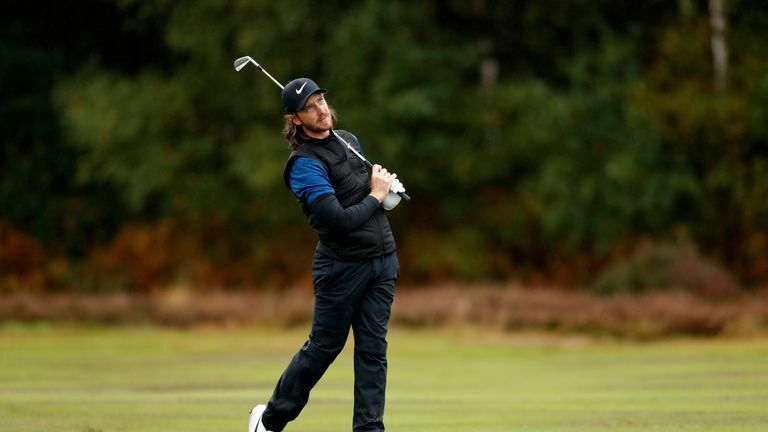 Tommy Fleetwood is pleased to still have a chance of retaining his status as European No 1 ahead of looking to close the gap on Francesco Molinari at the Turkish Airlines Open. The Englishman sits second in the standings and trails his Ryder Cup playing partner, who does not feature in Antalya, by just over 1.2m points with three events left on the European Tour calendar. Fleetwood can close the gap to less than 50,000 points with a win this week at Regnum Carya Golf & Spa Resort, with the 27-year-old hopeful of reducing Molinari's advantage on the Race to Dubai. "It's nice to get to the end of the year and still have things to play for," Fleetwood said. "But there's still plenty to do and it really isn't at the forefront of my mind. "I would love to win, although I don't think anybody would hold it against Fran [Francesco Molinari] if he was to walk away with the Race to Dubai. "Winning the Race to Dubai is such a big achievement in your career. At the time it was the biggest thing I've ever done and still is. The one thing we wanted to do is make sure you didn't just sit back and enjoy that; it was about using that as a springboard to improve this year and to move forward. "I've had a lot of different things going on this year and it's been my first year playing in America with a full (PGA Tour) card. So to get to this point and still have a chance, however small or big, it's really nice and it just keeps you practising, keeps you working." Fleetwood's Race to Dubai challenge is a complete contrast to the one he experienced 12 months ago, where Justin Rose posted back-to-back wins to reduce his lead heading in to the season-ending DP World Tour Championship. "It's a completely different situation this year than last year where somebody else (Justin Rose) won the tournament to get quite close to me," Fleetwood added. "I know a win is going to get me somewhere near Francesco [Molinari], but there's a lot of things that have to happen before that. "I've been doing so many good things and the one thing that's been missing is kind of putting four rounds together. That for now is my immediate thought, just keep doing the same things and hopefully I'll be able to put it all together and win a tournament again." Watch the Turkish Airlines Open throughout the week on Sky Sports. Live coverage begins on Thursday from 9am on Sky Sports Golf and Sky Sports Main Event.